Communication between human beings is always imperfect. Therefore, many people find it hard to express themselves in a completely accurate way. This is especially the case when talking about your feelings. Despite this, some people still manage to find an effective way of expressing themselves. One such way is tattooing your body. Tattoos are one of the best ways of permanently connecting with a piece of art. However, not every person will get a tattoo with the same intention in mind. Some choose to get inked with something of great importance while others simply do it for sheer fun. Regardless of your reasons, getting a tattoo permanently connects a piece of art to your body. The popularity of tattoos dates back to decades ago when they were largely reserved for bikers, ex-cons and sailors. However, it is not until the past few years that tattoos were considered an important addition to a person’s body. This rise in popularity can be linked to artists who are now getting sophisticated tattoos. No wonder 46% of adults in the United States have been inked. Logan Lucky Ford is an entrepreneur who also happens to be a rising Instagram star and model. He is well-known for living life to the fullest by enjoying the present moment instead of fantasizing about future happenings. Taking a closer look at his social media and Instagram accounts (@whereislucky), you will realize that he is a huge fan of pets, to be precise dogs. This is because he is always posting photos of his dog (Baby), a Pomeranian from Ohio. Logan does everything in his power to create awareness about stray dogs and the importance of taking good care of them. To show the love that he has for his dog Baby, Logan decided to get a tattoo. 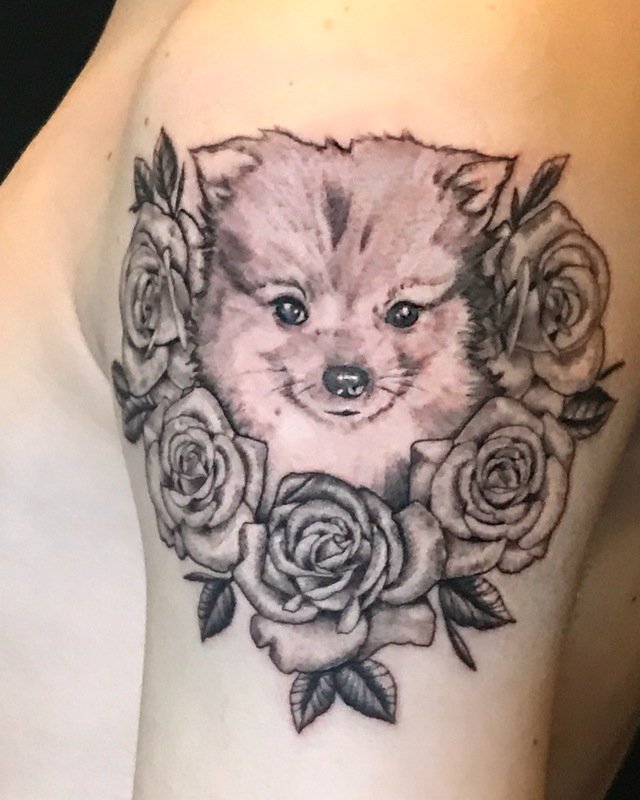 The tattoo is unique since it features a portrait of his dog with floral roses around her head. This beautiful piece of art is important as it lets the outside world know more about Logan’s strong connection with his pet. Logan’s beautiful art piece was done by one Khoi Nguyen, a famous tattoo artist. Khoi’s experience and amazing artistic talent has made him a force to reckon with in the industry. He, therefore works with high profile celebrities who are in need of tattoos. One such celebrity is Lady Gaga, a famous icon and pop star. Khoi is an employee of High Voltage Tattoo Shop, one of the world’s most famous tattoo studios. The shop owned by Kat Von D is known for coming up with unique tattoos. Most of these tattoos speak a lot about an individual’s personality. It is for this reason that the shop was featured in the reality TV series LA Ink for the last four seasons. Logan’s tattoo expresses the love and gratitude that he feels towards his pet Baby. It is, therefore, a true embodiment of how far people can go in order to show their love for something. To make it even more interesting, he is willing to share the love by posting photos on his Instagram account, Instagram.com/whereislucky, where he commands a huge following.